Registration is now open to our members for the 2014 National Gathering in Minneapolis, September 12-14, 2014. This is not a conference but a “gathering,” a get together that serves two important functions. First, the National Gathering brings together Strong Towns members (now nearly 400 people across 46 states) to share the best ideas about making our communities strong. Second, at the National Gathering our members are going to help set the strategic direction of the organization for the coming years. A keynote by Monte Anderson, a developer from North Texas who specializes in building human-scaled places incrementally. Release of Transportation in the Next American City, the long-anticipated Strong Towns report on transportation. An update from Gracen Johnson on the Next Generation of the Curbside Chat project. Kickoff remarks and closing thoughts from Strong Towns President Charles Marohn and a State of Strong Towns update from Executive Director Jim Kumon. Topic-specific strategy sessions led by Strong Towns members. There is an Open Streets event on Nicollet Avenue that begins right after the gathering that everyone is welcome to attend. On Friday morning prior to the start of the Gathering (8:30 AM – 12:00 PM), Chuck Marohn will be conducting a stand-alone workshop that covers the in-depth look at the Curbside Chat and Strong Towns transportation principles. AICP credit will be available for this workshop and will be a separate fee of $65. Registration details to follow. 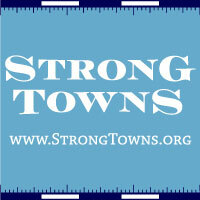 We hope to see you all at the Strong Towns National Gathering!